In this guide, we will talk about various ways to analyze the performance of your ad campaigns on Google Display Network. This analysis is performed with the help of the following metrics and dimensions: Conversions, Bounce Rate, Cost per Conversion, Clickthrough Rate (CTR), Demographics, and Traffic from different devices. 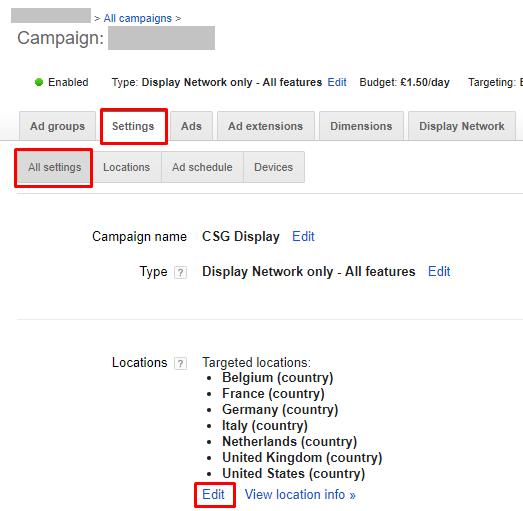 Note: This article is for people who manage Google Display Network Campaigns. Reader’s level of training: Beginner/Intermediate. 1. Make sure that conversion tracking is turned on and is working. Check the Tracking status; it should say “Recording conversions.” If the status differs from Recording conversions, there might be a problem with conversion tracking. To solve a problem with incorrect conversion tracking go to Google Support and follow the given instructions. Prior to importing any parameters, it is necessary to link your Google Analytics and Google AdWords accounts. 4. In a new window, click + New Link Group and select linked AdWords accounts. Click Continue. 5. 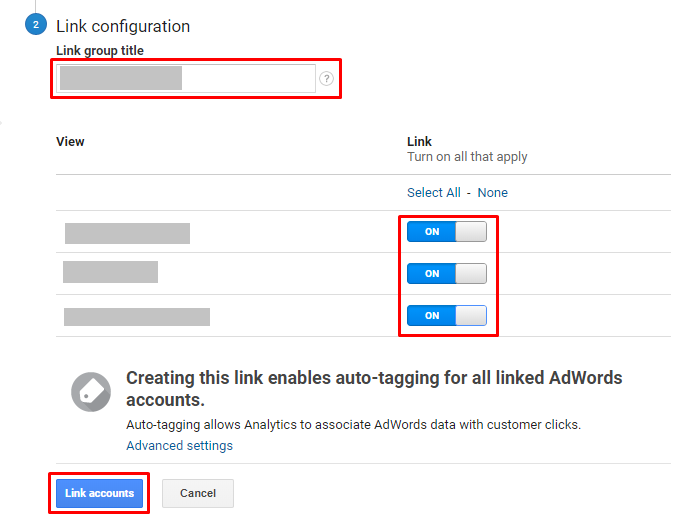 Complete the process of linking Analytics and AdWords accounts by titling your new link group, turning on all the views you need and then clicking on Link accounts. 6. After linking the accounts in AdWords, different metrics will appear in the Google Analytics tab. To display the columns from this tab, click the on Campaigns tab (or Ad groups, Ads, Keywords) and select Modify columns. 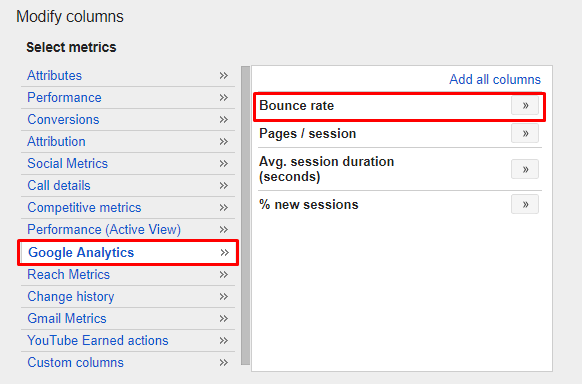 Then select the Google Analytics tab and click on the metrics you want to display. As you can see, Bounce rate is not the only parameter we are able to import. All the metrics on the screen above are available to be imported. As for Bounce rate, a high figure might be a concern. You should aim at lower Bounce rate, but it all depends on the campaign, as Google claims. If your display campaign is targeted towards different countries, it makes sense to check each country’s performance. Go to Google Adwords and sign in to your account. Click the Settings tab and select Locations. Select the campaign you want to check. 1) If the cost of conversion is just slightly high, you can decrease the bids. To do this, choose a country and click Set bid adjustment. Next, click Decrease by from the drop-down menu, enter an appropriate percentage (e.g., 20) and then click Make changes. 2) If the cost per conversion is not very close to your target, it may be more reasonable to stop advertising for the selected country. To do this, you will need to exclude the country from campaign locations. Click on the Settings tab and choose All settings. Next, find Targeted locations and click Edit. 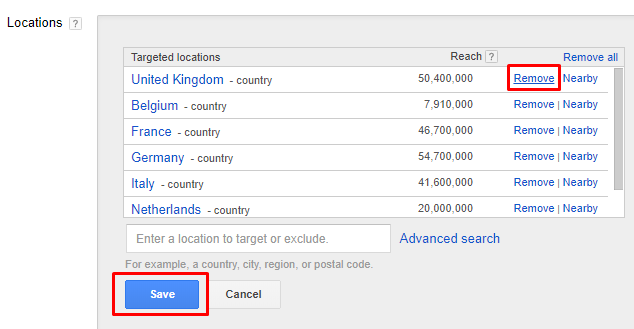 Find the campaign you want to exclude from the list of targeted countries, click Remove and then Save. Enter the location in the search field, choose Exclude and then Save. If the cost per conversion is OK, but the average position is low, you can increase the bid. 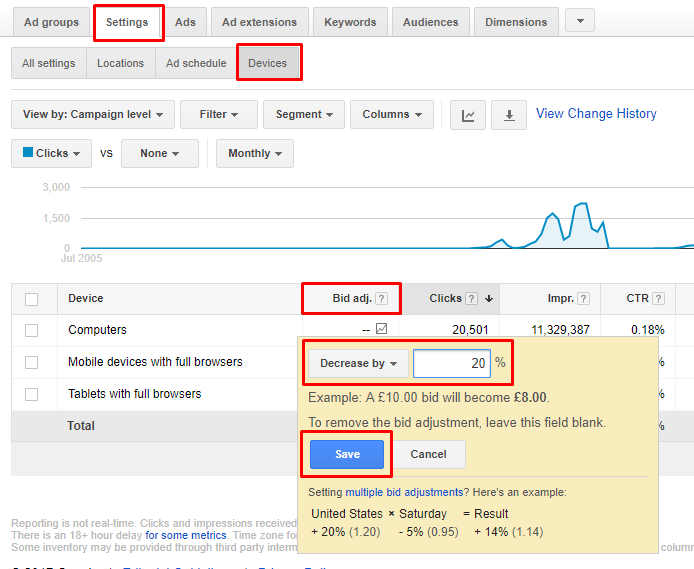 To do this, repeat the same steps as decreasing a bid, but in this case, choose Increase by from the drop-down menu. Placements are the sites where Google shows your ads. Usually, they are selected automatically (unless you specify them yourself), so it makes sense to analyze Placements to find inappropriate ones. If there is a low clickthrough rate (CTR) on a placement (many impressions, but few clicks), it is reasonable to add it to the exclusions.To do this, stay on the Display Network tab and Placements and find Campaign placements exclusions. Click + Exclusions. If Cost per Conversion exceeds the target value, you may also take excluding this placement into account. If your campaign is not supposed to be displayed in mobile ads, it is vital to exclude adsenseformobileapps.com in Campaign placement exclusions because advertising is often shown in games, and this is not the best place to advertise serious products. Select the campaign you want to analyze. Click the Display network tab and select Demographics. You can filter demographics by clicks, conversions, and impressions. Gender. If the product is targeted toward a male audience, perhaps the best solution is to turn off the ad for the female audience. 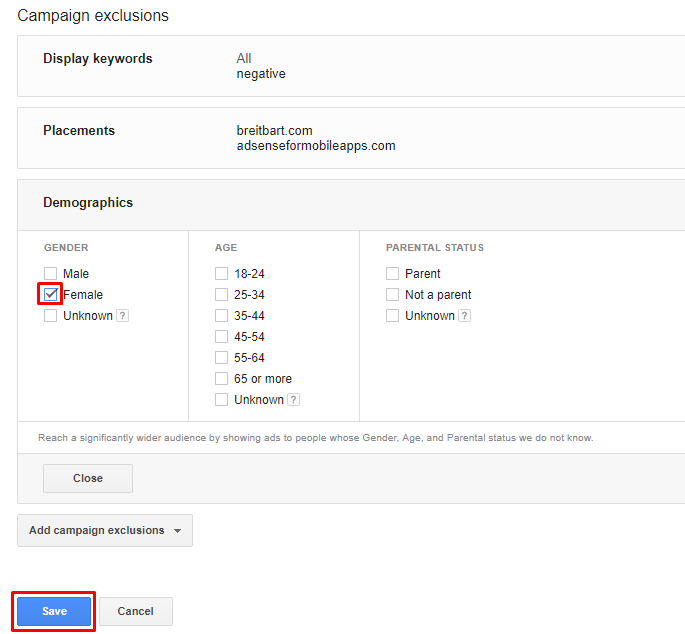 Stay on the Demographics tab and find Campaign gender exclusions. Click + Exclusions, choose Female and then Save. Otherwise, the cost of conversions may be too high. In the example here, with a target conversion value is 100, the conversion cost of Female is 5 times higher than Male! Which devices produce more conversions at favorable prices. If the cost is too high, you can apply the bid adjustment. To do this, stay on the current tab, find the Bid adjustment column and click on the dash that corresponds to the type of device you want to apply the bid adjustment to. Then select Decrease by from a drop-down menu, enter the value you want and click Save. If the cost is very high in general, you can stop showing ads for this type of device. To do this, follow all of the previous steps and enter 100 in the field. 1) Make sure that the conversion tracking is configured and working correctly. 2) Import parameters from Google Analytics to analyze the quality of traffic. 3) Segment traffic by country to check cost of conversion by country. 4) Analyze placements to check traffic volume, its quality, and cost per conversion. 5) Figure out demographics to target your product better. Eliminate Demographics that aren’t performing. 6) Sort out traffic coming from different devices to better adjust your bids. 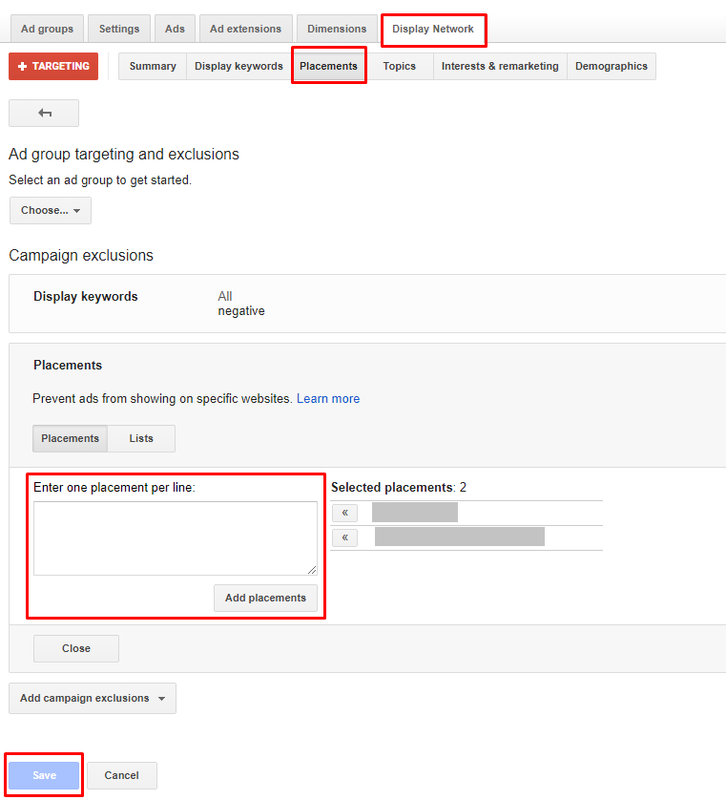 Do you follow these steps on your Google Display campaigns? Do you find them effective? Is there anything we missed, or that you would do differently?